Congrats to Saud Alashri on defending his dissertation. 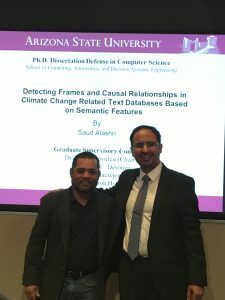 Saud will receive his Ph.D in Computer Science from the Fulton Schools of Engineering at Arizona State University. He will be joining King Abdulaziz City for Science and Technology (KACST) as an assistant professor.